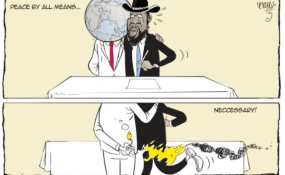 South Sudan's President Kiir has signed a peace deal with rebel leader Riek Machar. Kampala — The police in Moyo District are investigating circumstances under which a gunman sneaked into Palorinya Camp and shot dead a refugee previously linked to a South Sudan rebel group on Sunday night. Mr Stephen Agaba, the Moyo District Police Commander, yesterday said: "We experienced murder by shooting at Keguru Belameling Zone in Palorinya Refugee Settlement by unknown gunmen. Postmortem was carried out and it was discovered that the deceased was killed by one bullet which was shot on his neck and it passed through the mouth and shuttered the brain." Police have named the deceased as Nelson Sekwati Loyita, 34. Mr Agaba said a cartridge recovered at the scene showed the assailant used a pistol. Another camp resident, Mr John Ellison Isse, notified police. Detectives said their preliminary findings show that the deceased was a South Sudan government soldier who defected to Riek Machar-led Sudanese People's Liberation Army/Movement in Opposition (SPL/M-IO) before decamping to the National Salvation Front insurgent group. "Police so far have it that he was killed by his fellow rebels. We have not yet established whether the SPLA-IO belonging to Dr Riek Machar or National Salvation Front (NAS) group," Mr Agaba said. The late Loyita had for unexplained reason abandoned rebellion, escaping to Uganda where he registered as a refugee and was settling in a civilian life. Reports that some of the fleeing South Sudanese nationals cross to Uganda and enter refugee camps while armed with loaded guns are widespread. Mr Agaba said there was a plan of conducting operations to recover illegal guns in the settlements. "We gave them (refugees) time to elect their leaders and even offered them some security tips. We are going to embark more on vigilance and make sure that searching takes place, but again it also goes back to issues of intelligence and community perception," he said. Col Lam Gabriel, the deputy spokesperson of SPLA-IO, said the deceased defected in August, 2017 to join another rebel group headed by Gen Thomas Suma. "The SPLA/M-IO has nothing to do with his death in anyway. Besides, the SPLA-IO does not operate in foreign counties," the Colonel said.